If you are interested in running long cables between your church cameras and your video mixer in your sound booth a far distance away, then here is a solution I used recently to solve that problem. It is not usually ideal to have your church video mixer in the main santuary or place of worship because not only can the director/vision switch engineer's instructions be distracting, but it also becomes difficult for the camera operators to hear on their talkback headsets since the main sound will be picked up especially during the load music of praise and worship, so most churches will have a seperate room to the side of the main auditorium. This sometimes creates the problem of having to then run long camera cable lengths, which need to be chosen wisely, especially if you are outputing low quality composite video from your cameras for recording. Most video equipment on the market today supports the Digital Video format (DV), so the solution I'm proposing should work for most ministries even if you are only using an analogue mixer such as the cheap Sima 2 channel device. 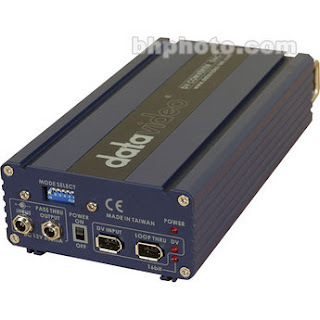 First let us deal with running a long length of cable from a DV camera to a mixer capable of accepting DV inputs like the Datavideo SE800 4 channel digital video mixer and switcher. In this case all we need is one 4pin to 6pin DV cable adaptor, the 4 pin end will plug into the DV end of the camera (the slot below the red socket in the picture), while the 6 pin end goes into one end of a Datavideo DV repeater, we can now plug into the other end of the repeater a DV cable upto 20m long which will then reach our SE 800 mixer in our video switching gallery. If we need more than 20m, we just use more repeaters and 6 Pin DV cables, in my situation, I needed an extra 10m run. We can use the same solution to run long cables to an analogue mixer like the Sima Video Mixer, but in addition to the cables, we will need a DV to analogue video converter. The work of the DAC is to convert the DV video signal to a format that can be used on an analogue device, in this case we want either an S-Video (better quality) or composite signal to feed into our cheap church mixer. This is not the only way to achieve a long video cable run, but this is what I have used recently to solve my own situation. Connecting equipment to video mixer Includes pictures.